Powers/Abilities: Able to fly, possesses superhuman strength and agility. Has a "robe of concealment" which allows her to pass as a mortal. Lethally accurate with a bow; carries a magical bow and golden arrows. History: Diana the Huntress would travel from her home on Mount Olympus at the order of her father Zeus, king of the gods, to fight evil and defend the weak. Anyone who found one of her arrows could also summon her aid. Comments: Created by an unknown writer and Burton Geller (artist). Diana appeared in the ten issues of Yellowjacket Comics. Zeus apparently ordered the other gods to help out too: Hercules had to assist the Allies, while Discordia was to confuse the Nazis. Diana seemingly got told to protect her native Greece. 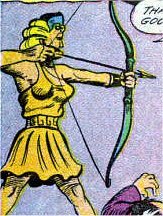 Pictures of Diana the Huntress courtesy of Steve Rogers' Golden Years Comic Book Library.